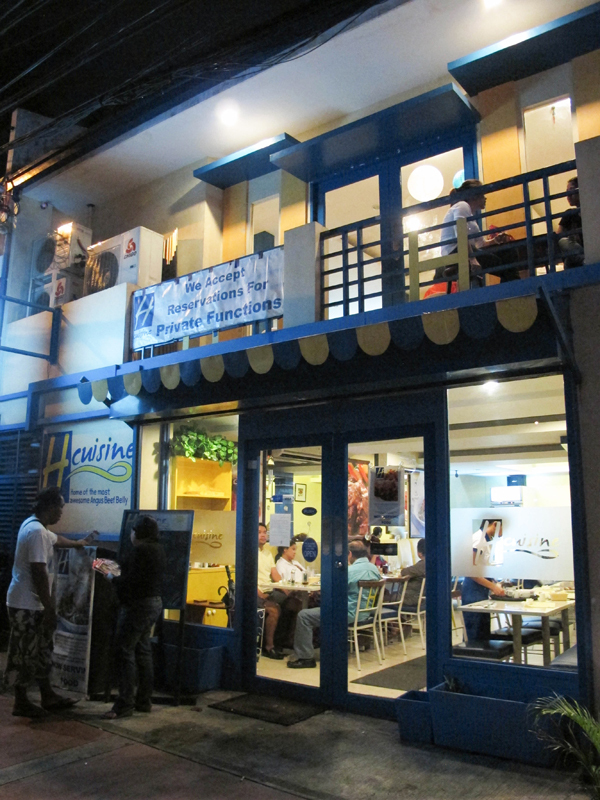 In the smaller street near Tomas Morato Avenue stands H Cuisine, a blue and white establishment that claims to be “The Home of the Awesome Angus Beef Belly.” My sister and her boyfriend had tried the restaurant before and gave us a good recommendation. So one Sunday night, with a visitor from out of town, off we went to H Cuisine. This is the Taco Salad that my sister and her boyfriend told us about. They’d come back just for this! 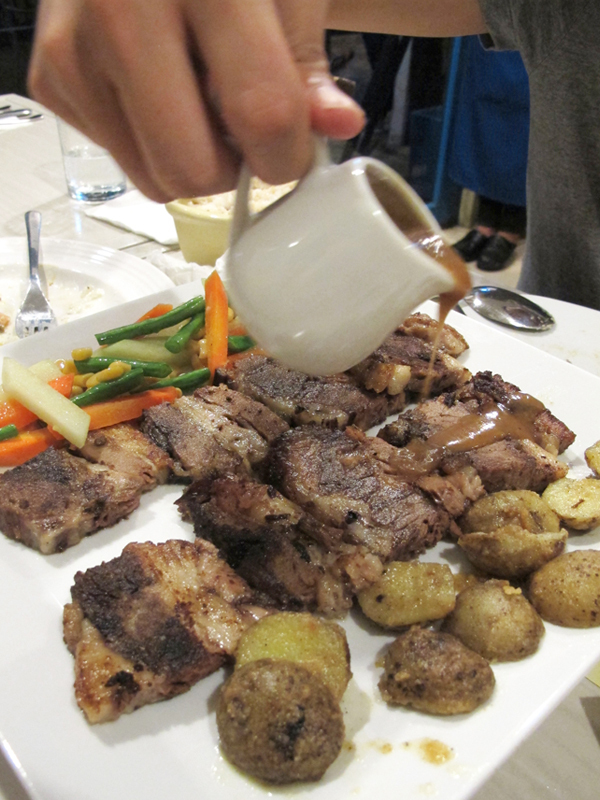 The Angus Beef Belly is pretty good and very tender, especially when drizzled with the gravy, but it was also really fatty. I guess it comes with the territory of the dish. The boys gave it two thumbs up and polished the plate in minutes. We had to order another big platter for them to eat their garlic rice with. Personally, I’m just not 100% sold on this though. 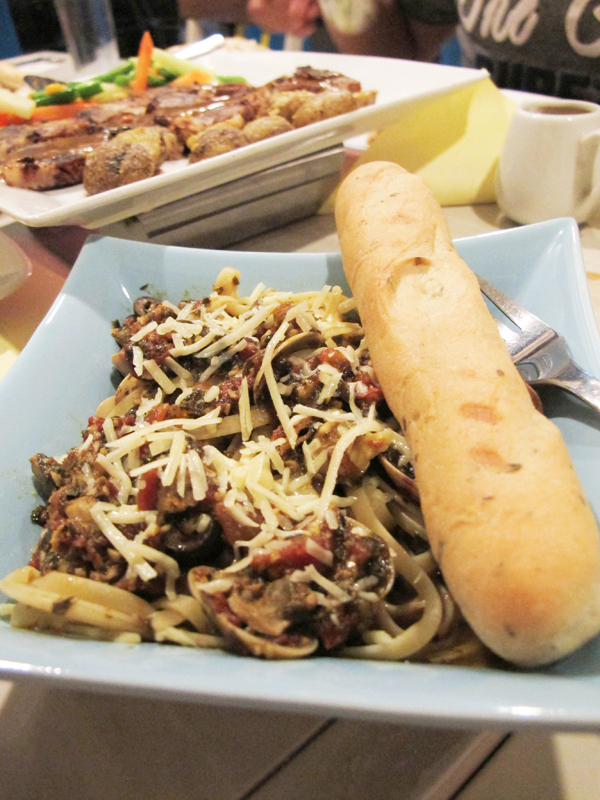 The portions of the pasta dishes were quite small and nothing special. I wouldn’t go back for them. The dessert…now that’s where H Cuisine could best tempt me into coming back. We ordered a carrot cake and flourless chocolate cake for all of us to share. The carrot cake was moist but sturdy and the cream cheese frosting was just sweet enough. Cream cheese frosting gets me every time. Yum. The flourless chocolate cake, on the other hand, was smooth and flavourful, hitting you with a mouthful of chocolatey goodness with every bite! The strawberry sauce that accompanied it was a bit tart and provided a good counterbalance to the richness of the cake. 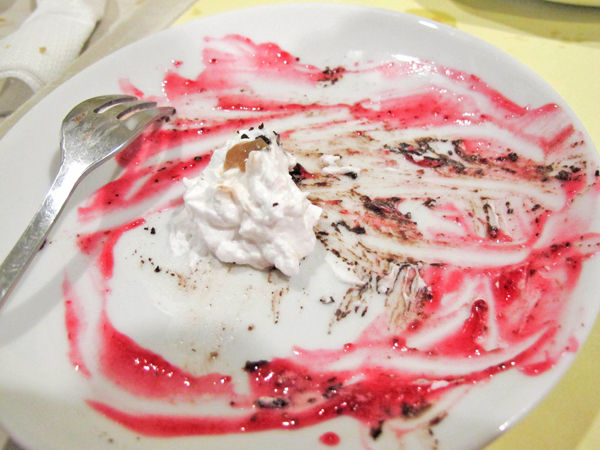 As you can see from the photo below, we literally scraped the plate clean (save for the whipped cream). In fact, I have no photo of the emptied plate of the carrot cake because we finished it so quickly and the waitress whisked it away (while I was busy attacking the defenceless flourless chocolate cake) before I could take a shot. 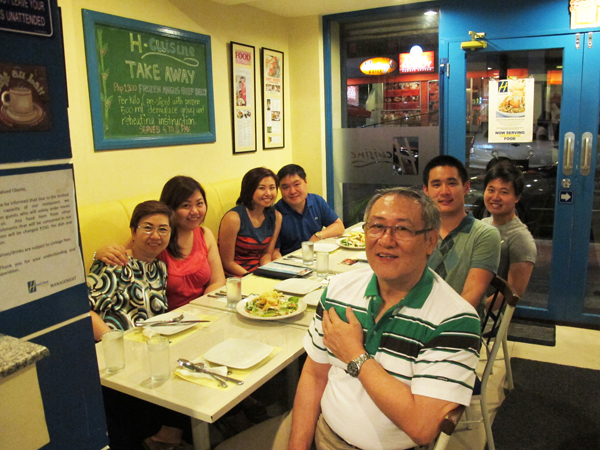 All in all, the cozy ambience makes it a good place to bring family or friends for lunch or dinner. 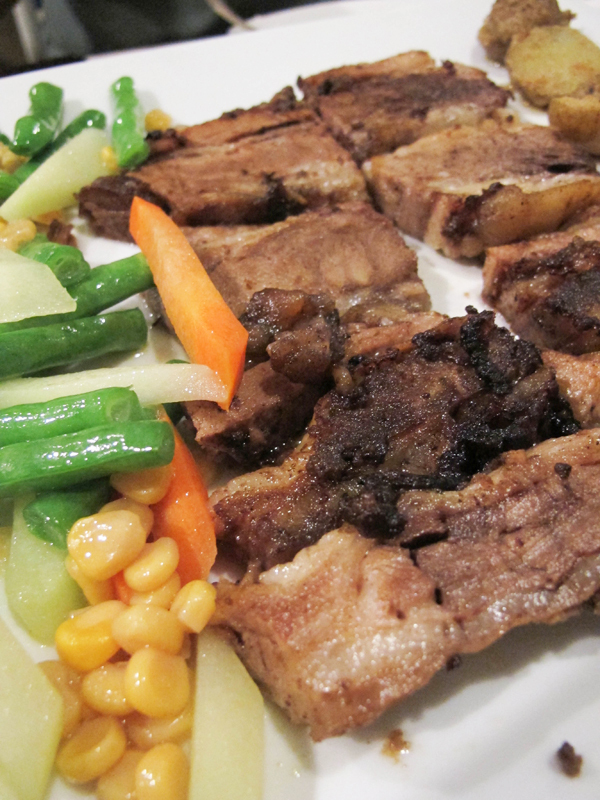 There are enough notable dishes that would stamp H Cuisine in your foodie memory. this looks really really good - i'm super hungry now! 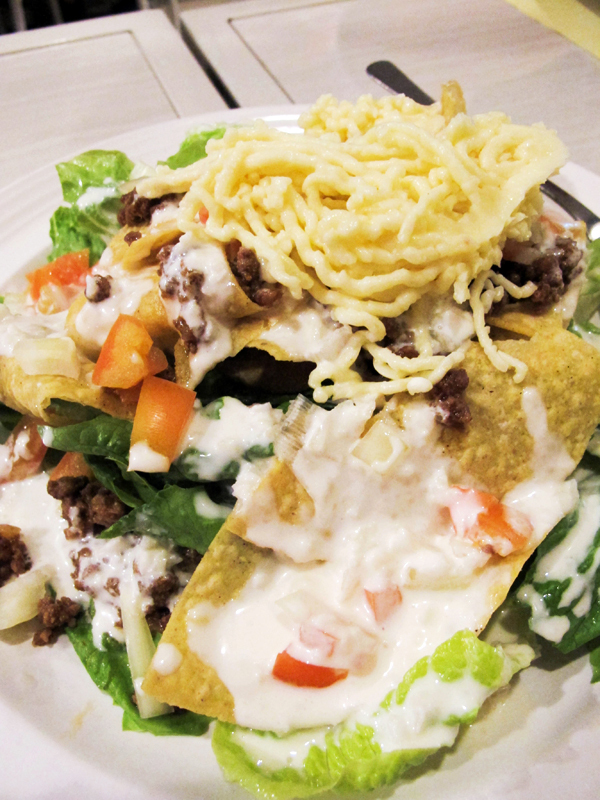 The taco salad looks great! Enter to win a $40 voucher to InDressMe! Long story short, I'm drooling on my keyboard. Looks amazing! You're funny, Caroline! Food photos have the same effect on me! Ugh looks so tempting; stop doing this to me! Droooling over the taco salad and beef! I so want! 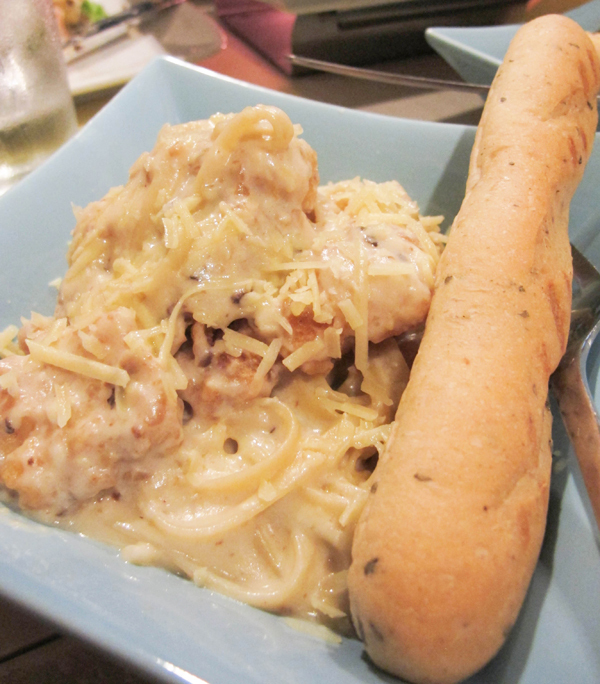 Just saad that this tempting resto is far out from my place. Haha! Too bad I didn't get to take a photo of the cake!